Unless you’re talking about pizza or an enormous bowl of pasta (and aren’t all bowls of pasta enormous? ), I don’t think one item covers it as a complete meal. It’s like in sugar cereal commercials where at the end of the spot you see a brief flash of the cereal bowl alongside a pitcher of milk, toast, a glass of juice, and some fruit while a rushed voice says “part of this complete breakfast”. Of course, in that example the extra things are there for “complete nutrition” purposes, but it’s a concept I am on board with. A sandwich can’t be a meal unless it has something on the side to round it out. A handful of baked chips, cut up fruit, or three-bean salad works well for me. 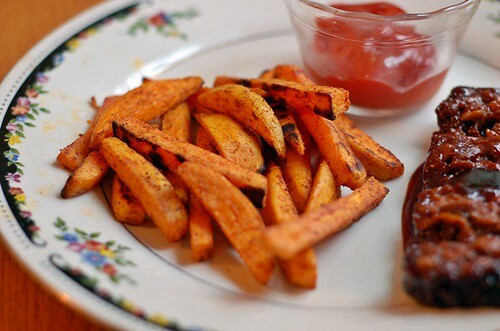 So do these baked sweet potato fries. Hot, salty, and full of flavor – they partner with the sandwich to convince me that yes, I have a complete meal in front of me, and I shouldn’t let my mind wander to the possibility of a “second supper” a few hours later. I let it wander to dessert instead. Preheat oven to 450 degrees and line a baking sheet with foil. Put the baking sheet into the oven to heat up while you get the sweet potatoes ready. Peel and cut sweet potatoes into wedges or sticks. Try to keep the shapes relatively the same size so they will cook evenly. Place sweet potatoes in shallow bowl (or if you’re like me, in a skillet) and add olive oil, seasoning, and a few dashes of sea salt. Toss to coat, making sure all of the pieces are seasoned. If you add sugar, it should help the fries get extra brown and crisp when they are in the oven. Carefully remove the hot baking sheet from the oven and arrange the potatoes on it in an even layer, leaving space between each piece. Return the baking sheet to the oven and cook for 10 minutes. Flip all of the pieces and return to the oven for another few minutes until they are lovely and browned. Looks great. I think I will make this for my mom when she is in town. She loves sweet potatoes! 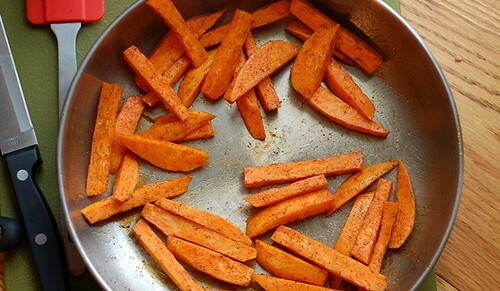 I am obsessed with sweet potato fries, but it’s damn near impossible for me to make them crispy. I bought sweet potatoes to make a soup I like but instead I am making these tonight. I love making my own fries in the oven! So much healthier, and so delicious. I have to tell you that I DID make them that night along with a ribeye recipe from Alton Brown that also involved a really high oven heat, stuck some asparagus wrapped in foil in there for a well balanced meal, and they came out amazing together. I dipped them in horseradish sauce, they were delicious! YUM. I love sweet potatoes. This recipe looks great. Sweet potatoes are the bomb and I have about four of them that I need to get rid of. This looks perfect! Thanks so much for the recipe.